And here&apos;s one up to the 17th. 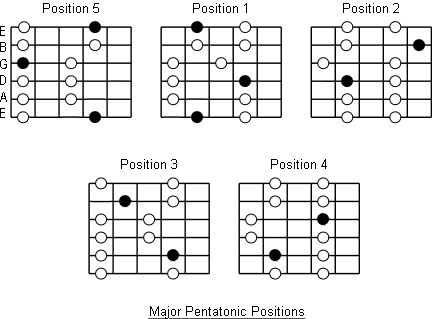 Here&apos;s a place where you can play A pentatonic minor. You can shift that pattern up or down the neck. I&apos;ve marked the root note as R and the V note as capital X. I call this the &apos;up&apos; pattern, because it&apos;s upward of the root note. Or you can play this adjacent shape. Which can also be shifted up or down for different keys. I think of this as the &apos;down&apos; pattern. 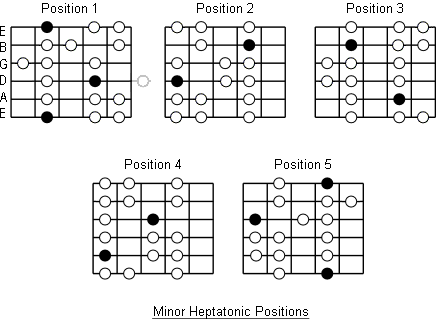 Within those scales/shapes you can add two notes to take it to A heptatonic minor. See the &apos;o&apos;s below. The blue note is often played in passing (well, that&apos;s how I play it anyway), so I&apos;ve indicated a few extra locations of this note, which make it easier to slide over this brief note. This is just how I think on a fretboard. Here is a classic way to travel up the board, moving through more than one shape. 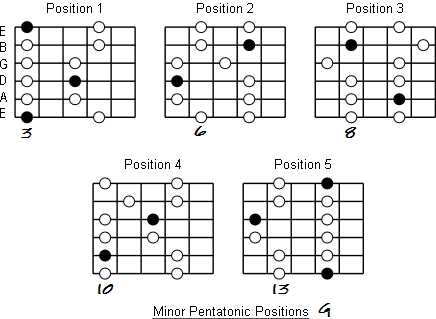 Some blues musicians will noodle around on just those five locations for an entire solo.